The year 2017 was another year that the Berli Jucker Public Company Limited (BJC) can be proud of. During the past year our business performance was exceptional as the total revenue from sales and services reached to 149,158 million baht, representing a 19.0% increase from 2016, resulting in a net profit for the shareholders of the company of 5,211 million baht, a 57.6% increase from 2016. With the vision to be the leader in the ASEAN region, we have focused on building and improving our business network in order to support our expansion strategy and to heighten our trade and investment capabilities in Vietnam, Cambodia, Laos, Myanmar, and Malaysia. 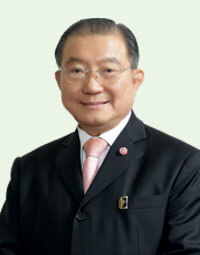 Moreover, we are supporting the Thai government’s policy according to the national strategic plan of combining the capabilities of public and private sector in order to strengthen the economy on the foundational level and by becoming one of the key performers in driving the improvement of Thai people’s living standards. I feel honored to be able to witness the continuous growth in all of the BJC’s business segments, especially in the modern retailing business where Big C Supercenter has given BJC a competitive edge by completing its supply chain that now reaches from upstream to downstream, making BJC both, a manufacturer and a retailer. During 2017, Big C Supercenter continued its expansion in all of its store formats by opening new branches in close to 200 locations across the nation to satisfy the customer needs in all of the regions. Big C’s hypermarket format was also redesigned during the year to better match with the current market opportunities and changing consumer behavior. We believe that Big C will be able to keep up its exceptional performance in the future and to sustain its growth, befitting its vision to be the “Thai retailer with customer at heart”. Throughout the past 135 years BJC has strictly followed the good governance principles in conducting its business with honesty and transparency, whilst understanding its responsibility towards the society and the environment, with particular focus on education and improving the quality of life to unlock human potential of its employees and members of the society; leading to a sustainable development of the country. To us, even more important than delivering outstanding business performance, is the pride we can take from being able to deliver it in parallel with the benefits for the Thai society by the continuous efforts of BJC Big C foundation in cooperation with various organizations and agencies to improve communities throughout the nation through various activities and initiatives. I would like to take this opportunity to thank our shareholders, customers, business partners, and other constituents who have supported BJC’s operations, as well as our board of directors and employees who have contributed their efforts and devoted themselves, enabling us to achieve our mutual goals. Copyright © 2015 Berli Jucker Public Co. Ltd. All rights reserved.